Bestow a precious gift upon a loved one, to help them change their life. 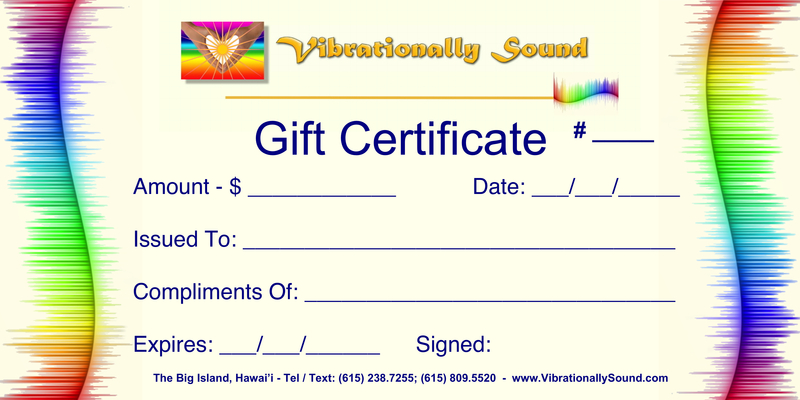 When you purchase a Gift Certificate, please also contact me here, to confirm the name and address of the recipient, and if you want it sent on any particular date. 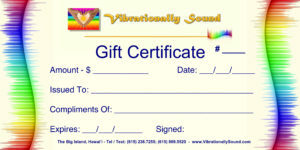 The Gift Certificate can be snail-mailed, e-mailed, or phone-messaged. You choose. A complete voice analysis consultation is $140, for 1 hr. 30 mins. (initial consultation only – pro-rated every 1/4 hour additional – subsequent consultations – $140/hour, pro-rated every 1/4 hour additional). Consultations are carried out either via phone or in person if you are based on The Big Island of Hawai’i. A short Voice Print and Reading costs $70. Level 1 & 2 Workshops are $500 each; purchase both workshops at the same time for a discounted fee of $900. Give the Gift of Self-Care, of Self-Empowerment and control over one’s health.